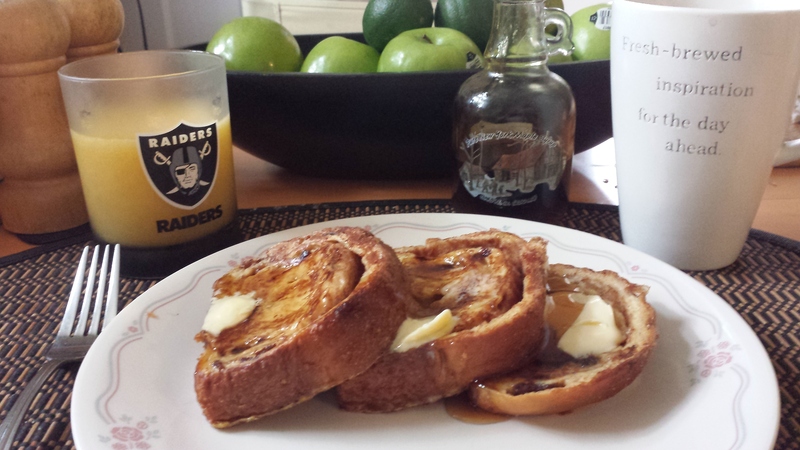 So, I picked up a loaf and this morning it was cinnamon raisin french toast for #Breakfast. I like using this loaf because it’s soft and absorbs the egg batter well. Most of you know I use Irish butter and New York maple syrup and with a cup of coffee, the day is looking just sweet enough. A pound of fresh, sliced to order bacon at the Polish butcher is around six fifty a pound… you can’t turn down an offer like that. I prefer mine thick cut snd not crispy. I like bacon you can take a knife to! 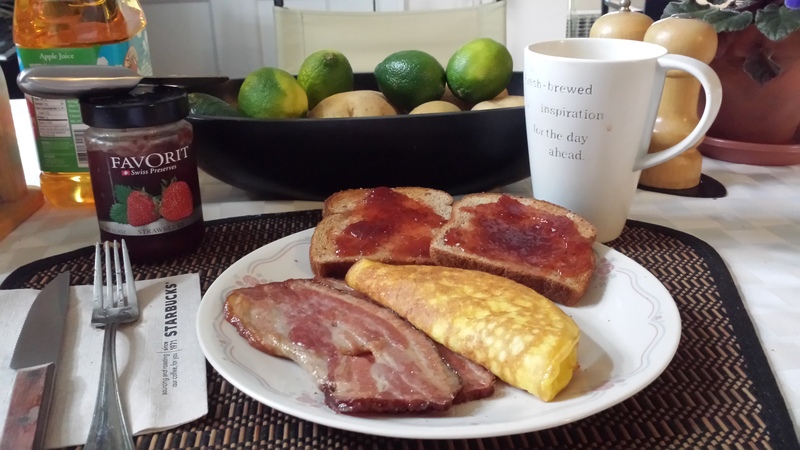 This morning I prepared it with a simple asiago cheese omlette and whole wheat toast. And I love a like swiss preserves on the toast… Favorite is my favorite. .. funny how that happens. 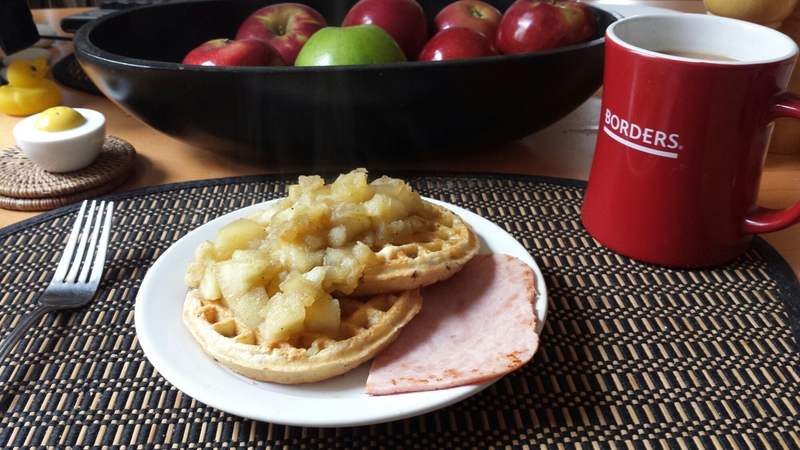 Waffles with carmelized apples and Black Forest ham. The apples are New York State macintosh from Terrance Mountain Orchard in Middleburg. I core, peel and chop the apples. Then they are tossed into a pot with brown sugar, maple bourbon and a little water. They get cooked over a low heat until a nice syrup startes to form. I cheated a bit here using me favorite frozen waffles, Aunt Jamima straight from the toaster oven. A little butter is applied then i spoon on the apples. You can kick up the ‘Autumn ‘ factor by sprinkling a little cinnamon sugar over these. Now, I like mine with a side of meat. In this case I pan fried a nice thick piece of black Forest Ham. I pick this up at the deli counter when it’s on sale. I ask the clerk to slice it thick adding that he should get only four slices on the half pound. That’s usually a good thickness to use for breakfast. And you can get a weeks worth of breakfasts out of that. 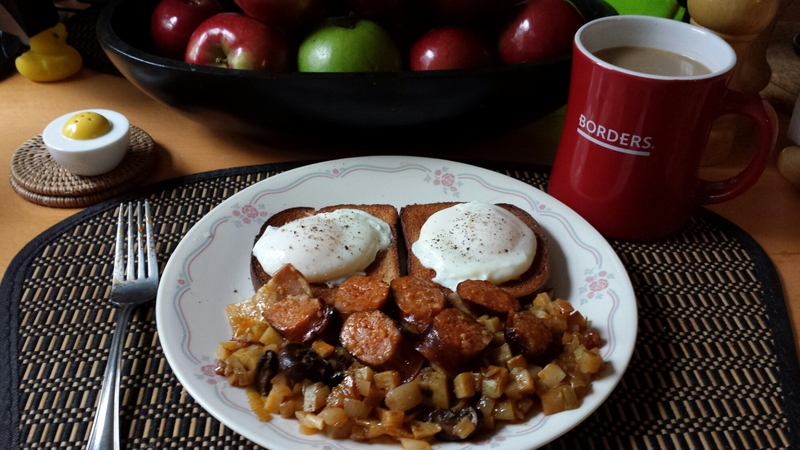 Two eggs poached on dry whole wheat toast with spicy Spanish potatoes. I poach my eggs in a rather small pot and gently transfer then to dry whole wheat toast using a slotted spoon. I like to keep the toast as dry as possible. This makes it more absorbant to the yolk as I tend to lightly poach the eggs. Perhaps a minute maybe two in the water once it starts to boil. The Spanish style potatoes are made nice and spicy by using diced chorizo sausage previously cooked (yup, leftovers). I get that cooking on a low heat with chopped onions. I dice up a medium potato, something low starch like red skin or tender white potato. The smaller the dice, the quicker the potatoes will cook. But to add flavor and lessen the cooking time I toss the diced potatoes in a bowl with a drizzle of olive oil and smokey Hungarian paprika. 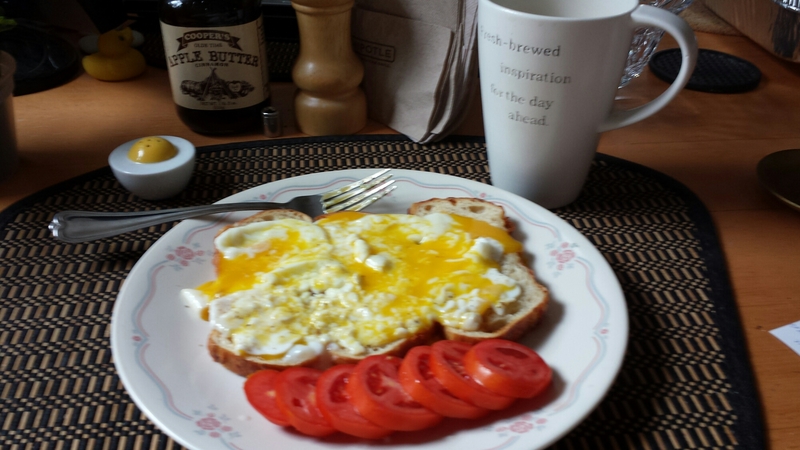 Two eggs poached on toasted asiago bread with tomatoes. Poaching is a delicate process. First bring a pot of water to a steady simmer. Try not to use too large a pot for poaching, smaller is better in my experience. Some people add vinegar to that water to help the egg proteins coagulate but i dont. The taste is not for me unless I’m hiding it behind a holindasse sauce. Now, crack a very fresh cold egg into a small bowl or ramekin. Give the pot a stir to create a gentle whirlpool effect and slide the egg into the water. The spinning water will help the egg white wrap itself around the yolk forming a more rounded poached egg. I’m a big fan of all matters of risky business, salmonella included. So I poach my eggs runny leaving them in the water only two minutes or so. Seriously, the risk of salmonella is so remote… please. For this particular breakfast I toasted up a couple of slices or asiago bread. A friend of mine brought it over because she didnt like strong flavor, her loss, my gain. I didn’t butter this either. When topping the toast with the eggs I want the toast to be as absorbant as possible. To finish this off, I simply washed and sliced up a plumb tomato straight from the garden and gave that a pinch of salt.